Description: You are an elegant beast of stealth and grace. With a polite sneer on your face, you dodge and weave through the enemies attacks, deciding to block a few. No fist will be permitted to spoil the neat lines of your outfit. You are the Dapper-Nin. You rise above norm, choosing to let them scuffle in the dirt. Specialty Weakness: Fuuinjutsu and Summons. Description: User uses their refined and elegant perception to help avoid or block taijutsu or kenjutsu. The dapper-nin wielding this technique will be able to react faster than others due to this perception. Effect: +5 Agility when blocking/dodging Taijutsu/Kenjutsu. Notes: The Agility bonus only applies to dodging Taijutsu and Kenjutsu. Range: Within line of vision. Length: Until Stamina runs out. Drain: 10 stamina every post. Description:This jutsu creates a constant Kai effect to defend the Dapper-Nin from any genjutsu that could ruin his composure. Effect: Blocks out the effects of Genjutsu of E-D Rank. Effect: +10 Agility when blocking/dodging Taijutsu/Kenjutsu. Drain: 20 stamina every post. Effect: Blocks out the effects of Genjutsu of E-C Rank. Specialty Description: You are the absolute pinnacle of dapperness. Tailors weep at the sight of you. You can match blows with almost anyone, yours being to more clean of the two. Genjutsu hardly ruffle your feathers at all by this point. Description: The user of this technique pauses to take a moment and reclaim the breath that is rightfully theirs before returning to ugly yet dreadfully necessary grind that is combat. Effect: After disengaging from any close combat, the user spends a post recovering. They regain 25% of their stamina. Notes: Requires the user to not be attacking, fleeing, or doing anything other than resting during the post. Hiding before using this is recommended, if your pride can take it. Effect: Blocks out the effects of Genjutsu of E-B Rank. Notes: Must be active to drain, or block out genjutsu. Does not dispel existing Genjutsu. Effect: +25 Agility when blocking/dodging Taijutsu/Kenjutsu. Range: Within line of sight. Drain: 50 stamina every post. Description: You are being of no illusions, ad you will not suffer attempts by others to place them on you. Effect: Constant Kai effect towards E-D Jutsu even with Mental Ward of the Dapper is not active. When active, this jutsu blocks out C-A rank Genjutsu and reflects E-D rank back on the caster. Drain: 100 chakra per post. Description: User uses their refined and elegant perception to help avoid or block taijutsu or kenjutsu, and now at the pinnacle of their form, Ninjutsu. The dapper-nin wielding this technique will be able to react faster than others due to this perception. Effect: +30 Agility when blocking/dodging Taijutsu/Kenjutsu/Ninjutsu. Length: Until Chakra runs out. Drain: 100 stamina per post. As much as this amuses me, it's denied. It's a physical based class, which is no real different than Taijutsu-nin class. On top of that you're trying to get away with too many permanent stat increase, that's already an immediate denial on that. And then out of no where you're coming out with a whole mental ward, just no, if the class was more focused thematically around increasing your mental prowress, sure, but it's a physical based classed, not gonna happen. A shade in the Shinobi world, Thanatos was feared a great deal due to it's merciless and indiscriminate nature, hated by and hateful towards mortals and cheaters of death. It once held its place as a neutral summon in the world, severing the lives of those dying, killing them and allowing the Shinigami to reap the souls. Despite the hate for the Daemon, this function was not frowned upon and so the other heads of the Clans steered clear of it. It wasn't until recently that the Daemon began behaving differently, Killing Mortals who was near death but not bound for it. Individuals who were really sick would find themselves dying way earlier than expected, and there has even been sightings where individuals in battle would see a hovering mask behind their nearly defeated opponents, only to moments later see it chomping off the heads and then vanishing. It is speculated that the drastic change in behavior was due to the decrease in death over the years, with Thanatos trying to balance things out. This was not something that the heads of the Clans could turn a blinds eye to, and neither could the Mortals. 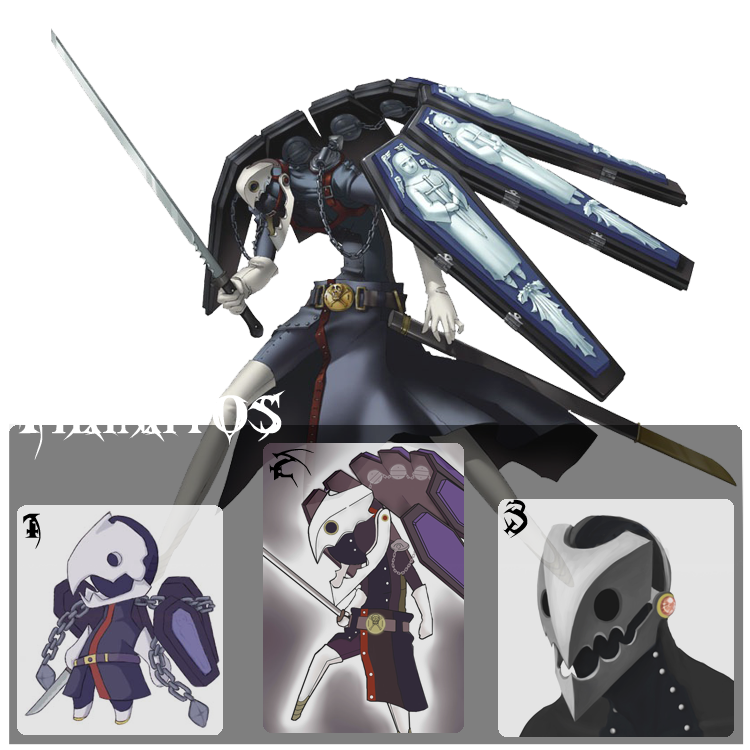 While being Deathless, Thanatos was easily defeated by the combined efforts of Summoning Clans as well as the Mortals. To ensure that it no longer have such a drastic effect on the life expectancy of Humans, it's original Power was shattered into three fragments of its former self, followed with being infused with a seal that prevents it from combining together again. It's now considered a Clan in itself, being composed of 3 Figures that governs over the Night, the time where Death occurs the most. It's indiscriminate nature displays with those few in the past who was under contract with it, being known to Kill the near death Summoners before the enemy even gets a chance to deliver the finishing blow by appearing behind them and engulfing their entire body, leaving no trace of the Summoners. Upon nearing Death (-5% of Total Stamina) The Summoners Life is Forfeit to Thanatos despite any abilities that may allow them to "Cheat" Death. Size Ref: The Size of a small Plushie that can sit on a Teen Female shoulder, or on their head. Clan History: A clan that is known for using their actual souls as weapons. They are a widespread and deep rooted clan that has holds in every country, though each country has separate heads and separate houses have no mercy for their fellow clansmen. Known for their split between the countries in the olden days when all the countries first formed. Each clan is a powerful force known for their dangerously good use of Improvisational Kenjutsu. Clan Populace: The various clan branches range from large to diminutive in size. 1. All soul shapes must be an object of some sort, no animals or plants. The item is accepted upon character creation by the Admin. 2. All soul shapes must feasibly sized to something that can be held in your hands, things can change form as you progress. (Ex. A Hand-axe to a Halberd, a short sword into a buster blade. 3. All abilities of the soul shape must be approved, these changes count as custom jutsu for the purpose of listing, this applies for everything but the soul change gauge marks which have set options for upgrades which counts as a bloodline jutsu. 5. Soul shapes disappear back into their owner is they are further than 20 meters apart, upon breaking, or if the owner becomes unconscious after 5 minutes. - Kenjutsu using the Soul Weapon is 20% easier to learn. - Cracking a soul shape results in a fatigued or exhausted state to the point of possibly blacking out. Breaks = Your Toughness stat < 5x where x is your toughness stat and 5x is the minimum amount of damage needed to break the weapon. You lose 50% your current stamina, you take 100 soul damage. - Fuinjutsu is 25% harder to learn and use. Increase: +5% for 500 words. 2o%: Custom soul shape upgrade. 4o%: Gain your first soul ring, and a Custom soul shape upgrade. 6o%: Gain your second soul ring. 8o%: Custom soul shape ability, and a Custom soul shape upgrade. Increase +5% for 250 words. oo%: You have started your journey to unlocking your own potential. 1o%: Your soul shape gains an affinity for your chakra nature. 9o%: The cost for all soul shape summoning is decreased by 5%. 1oo%: Your soul shape is exceedingly durable. When calculating breaks and cracks your toughness is counted as twice much for the purpose of calculating the formula. Description: By Meditating your body, mind, and soul can re-link and mend your broken soul shape of any cracks. Effect: Fixes soul shapes to their former shape before breaking, or cracking. Healing of any damage you suffered because of the soul shape. Notes: This heals any soul damage you have taken because of your soul shape. If you choose to heal your soul shape over time when it break each healing post heals ⅓ of the damage, but the soul damage isn’t healed until the soul shape is completely fixed.. Length: 1 post for cracks, 3 for breaks. 3. All abilities/soul rigns must be approved, these changes count as custom jutsu for the purpose of listing. 5. Soul shapes disappear back into their owner if they are further than 20 meters apart, upon breaking, or if the owner becomes unconscious after 5 minutes. 7. Soul rings do not have to be active at all times on a soul shape. Activating one or more increases the cost to maintain the soul shape. - The breaking of a soul shape renders the owner immobile if not outright killing them. Breaks happen if the incoming damage > 5 times your toughness stat. You lose 100% of your stamina and 90% of your S.energy upon the weapon breaking. This will send the character into a coma like state. Cracks occur if the incoming damage > 2.5 times your toughness stat. You suffer a 10% stamina and S.energy loss per crack. If a weapon recieves 8 or more cracks, it is considered broken even though the calculation for a break isn't performed. (Note: Soul Shape Upgrades change physical properties of the soul shape. This is what appears for your base cost, increases the base cost as the physical shape changes. These changes allow you to increase physical damage, change the exact shape, size, to anything reasonable for your strength level. Soul Rings are traits or abilities that can stay active so long as the soul shape is out and increases the cost of the soul shape because these abilities don’t count as jutsu and are more of a property of your soul shape while active (EX. being magnetic). Description: By Meditating your body, mind, and soul, you can re-link and mend your broken soul shape of any cracks or breaks. Effect: Fixes soul shapes to their former shape before breaking, or cracking. Healing any damage you suffered because of the soul shape. Notes: This heals any soul damage you have taken because of your soul shape. The soul recovery skill doesn't have to be used all at once, and If you choose to heal your soul shape over time when it's broken, each healing post heals 1/5 of the damage at 50% and 1/3 at 100% per post, but the soul damage isn’t healed until the soul shape is completely fixed. Description: Using chakra you forcibly stop vision from the eyes. However, as this effect persist you can see through ground tremors and your other senses are heightened to extreme points. Effect: Visual genjutsu is negated while this effect persists. Tremor sight of 10 ft. (up to 100 ft.) and smell and hearing senses as sharp as a canines. Notes: Blinded, poor ability against airborne targets. Description: Using chakra you forcibly stop vision from the eyes. However, as this effect persist you can see through ground tremors. 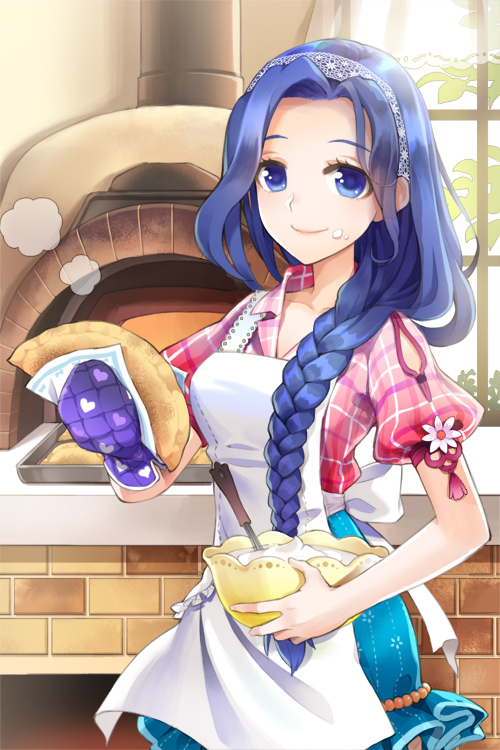 Personality: Complete opposite of her son, Ari is a Kind woman who rarely hesitate with her actions or words. Very loving to Val and who are considered his "Friends", her actions often lead others to thinking that she believes that she's everyone's mother. While being this way, it often create really awkward situation for Val, as well as those around him because her inability to recognize " The Line " which leads her to crossing it all the damn time. Just looking at her, its almost impossible to tell that at one point in her life, she was a Jonin for the Hidden mist, and someone who had so much blood staining their hands. Her Persona is not a guise though, as her love, actions, and words are very sincere. Alright Valesti, most of this looks good but I did spy a couple problem areas. - If she has the three Yuki clan bloodline jutsu, then she'll have to have a max'd out ice master gauge as the Makyō Hyōshō and Ice Release have that in their requirements. Personality: Complete opposite of her son, Ari is a Kind woman who rarely hesitate with her actions or words. Very loving to Val and who are considered his "Friends", her actions often lead others to thinking that she is the "Mother of all". While being this way, it often create really awkward situation for Val, as well as those around him because her inability to recognize " The Line " which leads her to crossing it all the damn time. Just looking at her, its almost impossible to tell that at one point in her life, she was a Jonin for the Hidden mist, and someone who had so much blood staining their hands. Her Persona is not a guise though, as her love, actions, and words are very sincere. Description: The 5’6” pole staff has evolved, the entirety is a deep saturated violet color and the tips have small black metal heads that seem to double as both decoration and weapon heads. The whole pole has taken a rather flat shape being one inch thick and about four inches in depth. About a foot from the left end of the pole is there is a slit cut into the pole, surrounding the slit from both ends of the opening are small metallic rings that at used to hold in the contents of the pole staff. Binding the rings together is a stiff unshifting cloth. Undoing the cloth the pole arm becomes a sheath and opens to reveal a 4’6” blade that teeters on being semi impractical. The blade is sharp to the touch and entirely capable of slashing through objects if its user can handle it properly. Notes: The blade requires an Str of 40 to use properly with one hand. If lower than that two hands, if the Str stat can be doubled to equal 40, may be used to make weak swings equal to 20% of the sword's true damage. Description: The 5’6” pole staff has evolved, the entirety is a deep saturated violet color and the tips have small black metal heads that seem to double as both decoration and weapon heads. The whole pole has taken a rather flat shape being one inch thick and about four inches in depth. About a foot from the left end of the pole is there is a slit cut into the pole, surrounding the slit from both ends of the opening are small metallic rings that at used to hold in the contents of the pole staff. Binding the rings together is a stiff unshifting cloth. Undoing the cloth revealsthe pole arm as a sheath that opens to reveal a 4’6” blade that teeters on being semi impractical. The blade is sharp to the touch and entirely capable of slashing through objects if its user can handle it properly. Notes: The blade requires an Str of 40 to use properly with one hand, if lower than that it requires two hands. If the Str stat can be doubled to equal 40, may be used with one hand to make weak swings equal to 20% of the sword's true damage. Also from now on, please put where the permit is coming from in future upgrades. For instance, where this is coming from is the D rank soul shape upgrade provided at the 10% mark on the clan gauge. Another little thing, is please don't request permits for things that you haven't quite unlocked yet. Description: By focusing chakra in one’s body to a singular location they secrete a sticky, sweet substance much like honey. It comes out from all over the body starting at the hands and moving up the arm and down the body from the shoulders, they can only create as much honey as their is surface area left on their body to store the “honey” substance. From there it can be utilized for various techniques that use the “honey” as a basis for their use. As the honey is used, the stored honey will move up the body to the hands, where it can be removed from the body freely. Effect: Allows the user of this technique to convert chakra into a sticky substance that resembles honey. Being covered in the substance causes mobility to slow, including the user to a lesser extent. Separate limbs count for their own lose. (Ex. One arm is a 5% loss, two arms is a 10% loss of Speed and Agility.) The substance will only add this effect if each afflicted limb is covered in at least 1/10 (rounded down) of the person’s body weight. Arm(s): 5% of your Agility, rounded up. User loses half of this when covered in the substance. Leg(s): 5% of your Agility and 10% of your Speed, rounded up. User loses half of this when covered in the substance. Torso: 5% of your Agility, rounded up. User loses 5% when covered in the substance. The substance that is secreted comes out in an amount equal to the amount of chakra used to create it. Every 10 points of chakra is one pound of “honey”. The maximum drain is that of creating the “honey” at one time. Unless otherwise dispersed or used, “honey” can only leave the body from the hands of the user. Other jutsu that changes the effects of the “honey” add to this cost. It can be removed, off the afflicted, if one disperses chakra from the parts of the body where the “honey” is covered. The expense to do this is 10 points of chakra per pound being removed. Length: Indefinite; until removed from the person. Drain: Max of 25% of your total chakra(Minimum of 10), or the user’s body weight; whichever is less. Description: Using previously created “honey” the user pours very miniscule amounts of chakra into the honey after its creation to make it rise in the form of small honey bees that will swarm around the user if the technique and homing in on any target that the user directs them towards. Effect: Create small honey bees made out of “honey” that will fly around the user and home in on a target when directed. Notes: Each bee is one ounce and no bigger than a quarter of a dime. When they hit something they apply weight towards the detrimental slow that the “honey” causes. These bees can be affected by changes to the “honey”. If they are destroyed via physical touch they pop into a ounce worth of honey. Bees listen to their creator after being made. Length: Until the bees are dispersed. Description: Using previously created “honey” the user pours very minuscule amounts of chakra into the honey after its creation to make it rise in the form of small honey bees that will swarm around the user if the technique and homing in on any target that the user directs them towards. When they hit something they apply weight. For every 10 'bees' successfully hitting the target. In centuries past a great Shinobi was born in the Land of Lightning. This Shinobi bore a special Seal on their person that lent them great strength, and through the accomplishing of many great deeds, he began to establish his own clan. Throughout the ages, the Unmei clan have been renowned Spies and Assassins, as well as peaceful advisers or even simple citizens. More recently, after the last Great Shinobi war, some of their number migrated to Konoha as a sign of good faith between the Nations. However, despite the great deeds those of their name may be capable of, their family harbors a darker side to their number. As some have been outcast or even quietly disposed of by other members of the bloodline in order to keep the dangerous nature of their Seal marks secret, and the maddening nature they inflicton the wielder forever only known to their own kind. Clan Weakness: Those of the Unmei clan are usually lithe in stature. - Marked by Fate: Every member of the Unmei bloodline are born with a Mark on them, often signifying great potential. - Fateful Reflexes: For every integer of 100 points reached, those of the Unmei bloodline gain an additional five points in Agility. Clan Gauge: Fate-Driven: You will achieve your destiny! Greatness awaits! o%: --. Your Seal appears. You begin your journey towards your Fate. 1o%: --. Your Seal melds with your Chakra, create an elemental jutsu based on your primary chakra nature of E-D Rank. 2o%: --. Learn "Path of Fate". Your Seal spreads. 4o%: --. Learn "Fate Unfurled". Your Seal spreads further, covering half of your body. 5o%: --. Your Seal spreads, tying you ever-further to your fate. You can now resist E-Rank gen-jutsu. 6o%: --. Your fate draws ever-nearer, create a Jutsu of your primary Chakra type of D-C Rank. 7o%: --. Learn "Glorious Destiny". Your Seal all but consumes you now, covering nearly every inch. 9o%: --.The ties of fate whisper to you, spilling forth more secrets. Create a Jutsu of your primary Chakra type of C-B Rank. 1oo%: --. Learn "Fated Punishment"
Fate-Obsessed: So close... only a few more obstacles remain. None of them shall halt you. o%: --. Your fate constantly weighs on your mind, your Seal covers your entire body. 1o%: --. Learn "Fateful Form". Can only sustain one extra appendage. 3o%: --. You can feel your Fate approaching, it's presence fills you. Create a Jutsu of your Primary Chakra type of B-A Rank. 4o%: --. Fateful Form can now sustain two extra appendages. 5o%: --. Learn "Fateful Judgement"
7o%: --. Your fate will not be hidden from you! Can now resist B-Rank Gen-Jutsu. 1oo%: --. Learn "Wings of Fate"
Demon of Fate: Your obsession has consumed you, your fate dies with your humanity. o%: --. Your teeth sharpen and elongate, your eyes take on a deep, piercing red color and your nails turn to claws. 25%: --. Obsession is all there is, nothing else. You can now resist A-Rank Gen-Jutsu. 5o%: --. Fateful Form can now sustain four extra appendages. 9o%: --. Can Learn "Eye of Fate"
1oo%: --. Can Learn "Damnation"
Description: Your fate propels you forward, leaving unstable chakra in your wake. Effect: The user propels themselves forward incredible speed, leaving a trail of paralyzing chakra behind them. Description: Tendrils of chakra emerge from your Seal markings, and lash out with deadly accuracy. Description: A Seal symbol appears beneath your opponent before erupting in a bright flash of light. Effect: Blinds opponent, cannot blind those with the Unmei Seal. Description: The user forms a large spear of chakra before launching it with explosive force towards the enemy. Effect: The Spear lodges into the opponent, dealing damage over time until removed. Description: Pure Chakra energy flows from the Seal mark on your body, before forming into an additional arm-like appendage. Effect: Allows for additional physical strikes, and for every two additional arms an additional Jutsu used. Description: The user forms a mass of chakra around their opponent, before bringing the chakra crashing into them from all sides and above. Effect: Crushes the opponent between walls of pure chakra. Description: Two wings of Chakra form from the Seal markings on your person. Description: You form your Chakra into a blazing eye that casts away all Gen-Jutsu before it, it's gaze locked firmly on the opponent who would dare to try and deceive you. Effect: Satisfies the special stipulation of escaping S or S+ Rank gen-Jutsu and paralyzes their user. Length: 1 post, paralyzes opponent for 1 post. Description: You form a large mass of Chakra in the sky, before bringing it crashing down over a wide area, devastating all but yourself caught within. Effect: Devastates all found within besides the user, even the landscape is not spared. - Fate Obsessed can only be achieved if the character has done something against their own personal nature in pursuit of their destiny/fate. Demon of Fate can only be unlocked by the user committing cold-blooded murder in the pursuit of their fate/destiny. Once you begin to unlock percentages on Fate-Obsessed, your character's mental state will begin to deteriorate. I will like to state that what you put down is quite interesting and could be of further use later down the road, but for a starting bloodline, not all of it's gonna fly. As it is, this reads more like a class then it does a bloodline/clan. Take my notes into consideration and resubmit a new draft, or something entirely new, that's all up to you. In it's current state, Unmei is denied until a new draft is written. When resubmitting, send it in as a new post, do not edit the old one. However, despite the great deeds those of their name may be capable of, their family harbors a darker side to their number. As some have been outcast or even quietly disposed of by other members of the bloodline in order to keep the dangerous nature of their Seal marks secret, and the maddening nature they infliction the wielder forever only known to their own kind. Clan Proficiency: Ninjutsu; Resistant to gen-JutsuFrom how this all reads, it infact would make them more suseptible to gen-jutsu's. There is no strong reason to why they would be resistant to it. ontop of that, If you rewrite it so it does make sense, you need to start what kind of Genjutsu; there are visual, audio and touch ones. Unless the whole thing is going to be geared specifically to countering against it, gonna need to be specific. 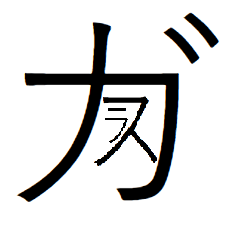 - Fateful Reflexes: For every integer of 100 points reached, those of the Unmei bloodline gain an additional five points in Agility. That's asking for way to much stat boosts in the long run. - Thin Stature: Maximum Strength Stat = 1/2 of Agility Stat rounded up This is fine if you wanna keep it, but since I struckout the Fateful Reflexes, feel free to take this out. 1o%: --. Your Seal melds with your Chakra, create an elemental Bloodline jutsu based on your primary chakra nature of E-D Rank. 6o%: --. Your fate draws ever-nearer, create aBloodline Jutsu of your primary Chakra type of D-C Rank. 9o%: --.The ties of fate whisper to you, spilling forth more secrets. Create a Bloodline Jutsu of your primary Chakra type of C-B Rank. 3o%: --. You can feel your Fate approaching, it's presence fills you. Create a Bloodline Jutsu of your Primary Chakra type of B-A Rank. ------------------ Now here's the tricky part, you only get two gauges. so pick the two you want, whatever you didn't pick get's thrown out. Or reused as a jutsu or something later on. Clan Jutsu: Gonna say this straight off the bat, limit the jutsus down to 5-7. Damage Notes: Paralyze If caught in the unstable chakra, and if so paralyzed for 1 turn. Drain: 80 Chakra to summon, 30 per turn to sustain it. Word Count: 750 This one is completely random and doesn't seem to fit into the theme you've built up into this point. This could however be used later on as your characters own personal jutsu, so you can save this for later. Word Count: 4,000 words again, with how you written this up, theres no way you're character is stable enough at the point they learn this, that they would become invulnerable to genjutsu's all together. Notes1: For every 1,000 chakra it takes 1 turn to charge it. - Fate Obsessed can only be achieved if the character has done something against their own personal nature in pursuit of their destiny/fate. Demon of Fate can only be unlocked by the user committing cold-blooded murder in the pursuit of their fate/destiny. Once you begin to unlock percentages on Fate-Obsessed, your character's mental state will begin to deteriorate. With how you built it up at this point, this isn't necessary, they will deteriorate no matter what. - Fateful Reflexes: For every integer of 100 points reached, those of the Unmei bloodline gain an additional two points in Agility. - Kekkai Genkai Seal can lead to mental deterioration if handled improperly. 1o%: --. Your Seal melds with your Chakra, create a Bloodline Jutsu based on your primary Chakra nature of E-D Rank. 3o%: --. Your fate draws ever-nearer, create a Bloodline Jutsu of your primary Chakra type of D-C Rank. 5o%: --. Your Seal spreads, tying you ever-further to your fate. Create a Bloodline Jutsu of your primary Chakra type of C-B Rank. 6o%: --. Learn "Hands of Fate". Can only sustain one extra appendage. 8o%: --.You can feel your Fate approaching, it's presence fills you. Create a Bloodline Jutsu of your Primary Chakra type of B-A Rank. 1oo%: --. Your Fate is almost yours to claim. Create a Bloodline Jutsu of your Primary Chakra type of S Rank. 2o%: --. Hands of Fate can now sustain two extra appendages. 8o%: --. You will not be stopped, destruction awaits all who stand before you. Learn "Damnation"
1oo%: --. Learn "Fateful Form". Hands of Fate can now sustain four extra appendages. Damage Notes: Paralyze if caught in unstable chakra, for 1 post. Description: The user extends a palm, launching vicious spikes of chakra that pierce into the enemy. Description: From your Seal mark, additional arms made of pure chakra form. Effect: Can strike/block with the new arms, and for every two formed, can use an additional jutsu per post. Description: A Seal symbol appears at a chosen point near your opponent before erupting in a bright flash of light. Notes1: Affected cannot attack and remove spear in same post. Description: You assume the form your fate has led you to, altering your eyes, and general appearance. Effect: Add 10 to two stats of your choice and 5 to the other two. Description: The user launches an orb of pure chakra into the air, before launching a bolt of chakra from the orb at the opponent. Notes1: For every 1,000 Chakra it takes 1 post to charge, can be charged while moving. - Fateful Reflexes: +10 Agility Did some number crunching and didn't like the end outcome, so giving you a flat number to start out the door with instead. - Kekkei Genkai Seal can lead to mental deterioration if handled improperly. I did say 5-7 jutsu, not 8, gotta get rid of one. Clan History: This clan was originally a small tribe located in the desert. Despite being from the land of Wind, their members have an elemental affinity of fire, due to their kekkai genkai which permits them to transform sand (and rocks, as sand are pretty much tiny pieces of rock) into glass by heating it up to an extreme temperature normally hard to attain. However, it joined Suna at the first Shinobi War for protection and has trived in the hidden village ever since.